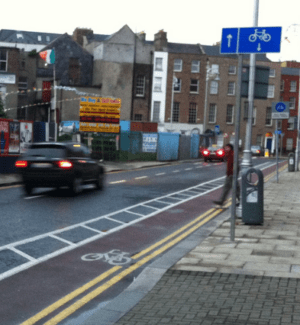 One-way streets without provision for cycling in both directions are a major barrier to cycling in most Irish cities and towns. It is one of the largest permeability issues in many areas, while in other areas it offers relatively low-cost additional permeability. Contra-flow or two-way access for cycling on streets which are one way for motorists could be covered as an extended part of the permeability section above. But as the issue is of a high importance, yet there has been little progress in decades in Ireland, this section is separate. 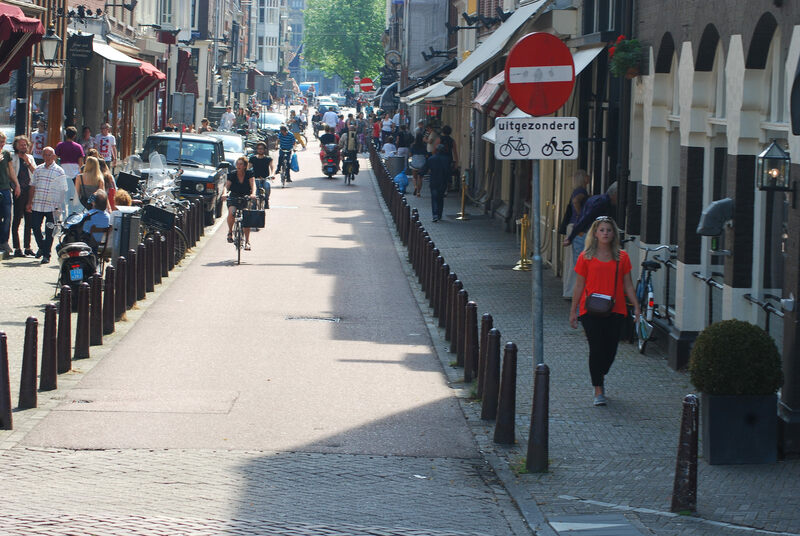 The idea of removing one-way streets or roads to make cycling more attractive is often a flawed principle, we should generally instead follow Dutch design where one-way streets are designed to be attractive for the three modes: walking, cycling and public transport. If the removal of one-way streets or roads is considered the designers must look at the impact this will have on the provision of dedicated cycle paths, bus lanes and wider footpaths. IMAGE: Sign shows contra-flow, painted cycling logo shows with-flow cycle lane. Lane also needs protection from illegal parking. Signage needs to be clear on contra-flow routes and a review must be undertaken looking at all current examples of contra-flow and how it can be made clearer to motorists that cycling is allowed both ways (ie standard signs at the with-flow entry point to contra-flow streets attached to the normal one-way street signs). 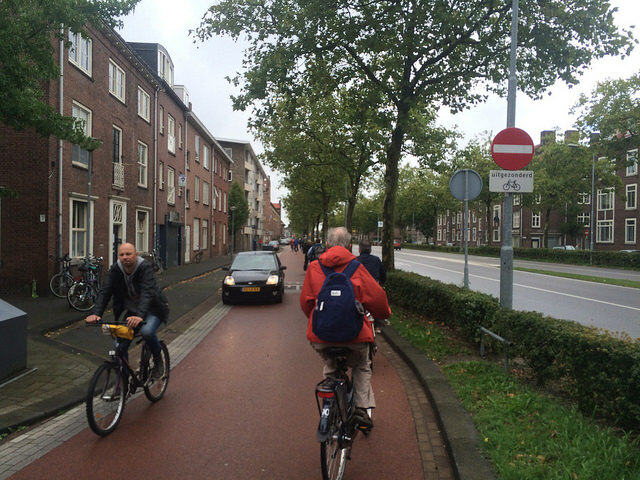 Cycling contra-flow without lanes should be used on low-speed residential or city/town centre street and roads. It has been proven to work extensively in the Netherlands, and cities such as London, Berlin and Paris, and less extensively in places like Copenhagen (because the limited number of narrow one-way streets). There are a limited number of examples in Dublin which are operating under the “no-entry, except…” system. While the system is common across Europe, there has been a long delay at national level to adopt the measure — in this regard, cycling contra-flow without lanes should be outlined as a key cycling permeability aid and be outlined for use in any updates of the Traffic Signs Manual; the Manual for Urban Roads and Streets; and the National Cycle Manual. Cycling contra-flow without lanes will be as a standalone measure and also as part of “bicycle streets” and/or parts of larger routes made up of different elements. It should not just be viewed as a tool for retro-fitting but also a design which can be implemented on new-build estates and town centres or on public realm schemes which seek to improve town and village centres. 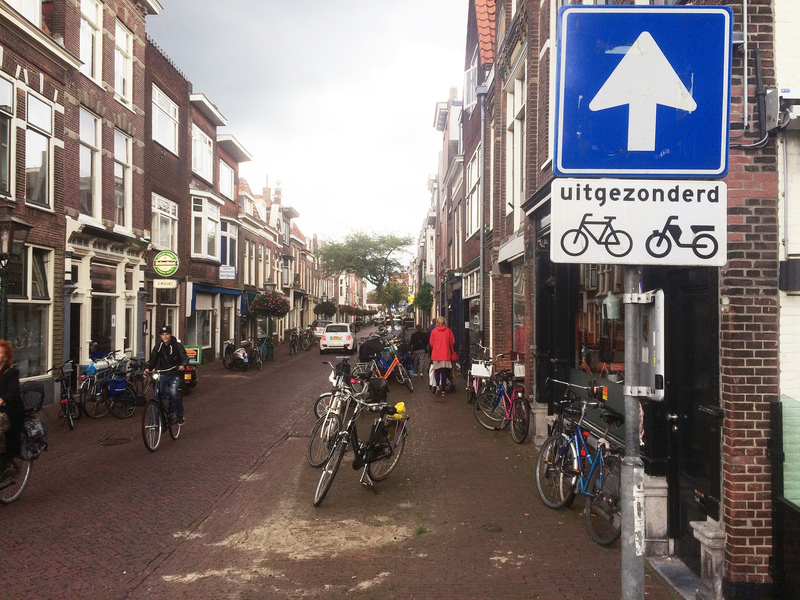 “Except bicycles” sign warning users entering a one-way street with-flow that cycling is allowed contra-flow. Except bicycles sign showing no entry, except bicycles contra-flow. A sign at a T-junction showing that the street you are entering is one-way except bicycles, which are allowed to go both ways. 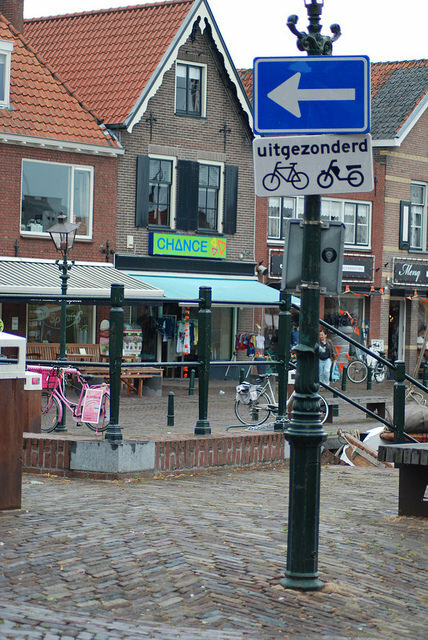 A no-entry except bicycles sign forms part of a bicycle street, where the one-way street alternates at every junction for motorists, but people cycling are allowed to go both ways. 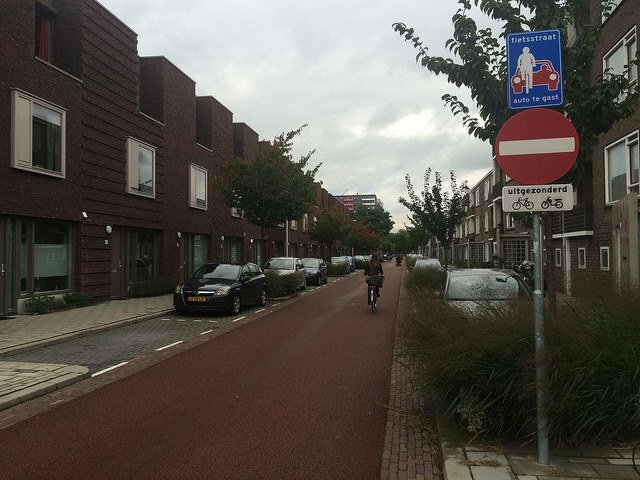 A service street (a street for access beside a two-way main road) which was made one-way except for cycling. On busy multi-lane one-way streets and roads, such as those in our cities and some towns currently designed for high traffic flow, councils should look at providing two-way segregation using two-way cycle paths or one-way cycle paths in each direction. 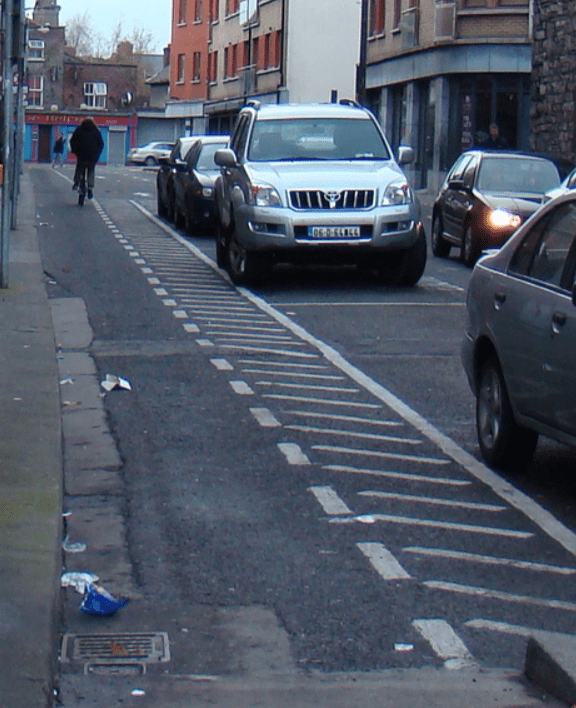 IMAGE: Conrta-flow lane protected by car parking and loading. This will usually require the relocation of space (general traffic lanes or parking to cycling), but the safety and access benefits should be viewed as outweighing any negatives. Heavy segregation should be used with bollards, high kerbs, planters, parking etc. In some cases cycle lanes may be suitable for low speed one-way residential or town/city centre streets and roads, but designers should be aware that on such streets to-date illegal parking is an ongoing issue on the contra-flow lanes. Retrofitting segregation using bollards, high kerbs, planters etc should be considered and new unprotected contra-flow lanes should generally not be considered unless there a strong commitment to ongoing enforcement.